At the idyllic setting of the Aigialos Hotel in Santorini the members of the Historic Hotels of Europe were united once again on the 23rd of October 2016 for the Historic Hotels of Europe Award Ceremony. After an exquisite dinner at the Selene Restaurant, attended by many guests, including representatives from the media, industry leaders and representatives from the finest Historic Hotels, the awards were given to the winners in recognition of their contribution to the highest standards of cultural and historical hotel keeping and hospitality in Europe. In an inspiring speech, the Chairman of the Historic hotels of Europe, Mrs. Barbara Avdis, said “Today the winners have been honored by their many guests whose emotive experiences in Historic Hotels from Norway to Greece have prompted them to vote for their favorite places with historical significance. 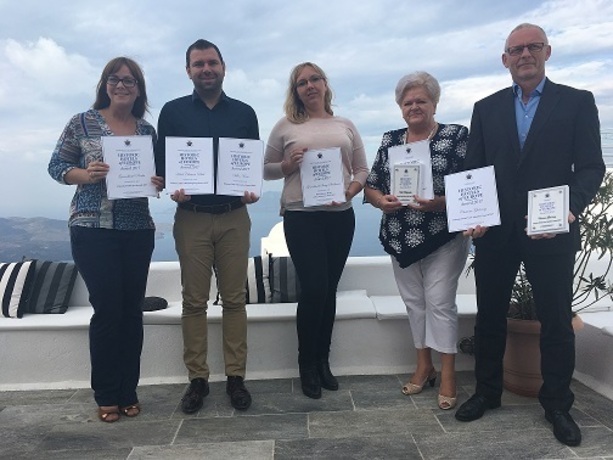 This year Historic Hotels Award Ceremony was hosted by Yades Greek Historic Hotels and their member hotels in Santorini. The Ceremony events included a guided visit by distinguished Prof. Dumas at the Akrotiri Archaeological site and Santorinian wine testings. All events were under the auspices of the Greek Ministry of Tourism and the Greek National Tourism Organization.